Nori's Reply: Bruce, thank you so much for the beautiful photograph of you and your bride. What a magical moment! 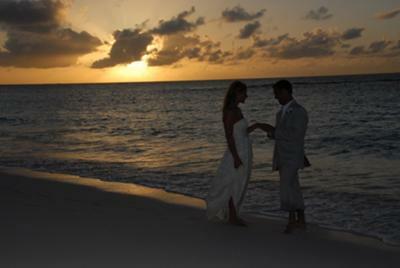 To be married on the most beautiful island, on the most beautiful beach in the Caribbean... Could it get any better? I hope to one day know the magic of an Anguilla wedding. Thank you so much for sharing this special photo! My fiancee and I are looking for an island to go to for our honeymoon. It seems like we have is narrowed down to St John or Cayman Island, but after reading your website Anguilla sounds great too! So I was wondering what your thoughts are as to where we should go. We are looking for something very romantic. Crystal clear water, white sand that you can go right into the water on... snorkeling... deep sea fishing... parasailing if possible... checking out a wreck site... not too many sharks? I don't know how possible that is, but I know some islands have more than others. Also we were looking for something all inclusive. We really wanted to just kick back and have everything done for us, and not have to worry about it. We are on a budget, but we really want somewhere special! Anguilla is very romantic, NBC did a story on Anguilla weddings and Anguilla honeymoons. It's no wonder why - the island is picturesque, the weather is ideal (day after day of endless blue sky on a desert island! ), the water exactly to your liking - white sandy bottom, calm and clear turquoise waters. The island offers most of the Anguilla activities you mentioned. There are hardly any sharks in Anguilla. There is snorkeling, deep sea fishing, plenty of wreck sites, but unfortunately no parasailing. You can, however, do that next door in St. Martin (only 20 minutes away). Anguilla is not an all inclusive island. Of course you can kick back and relax, but there aren't many package trips available that include your drinks and flight. You can check with some of the bigger resorts on the islands to see if they have special rates, but that's about as far as it goes with packages. Click here for more information on those Anguilla hotels. My best recommendation if you are seeking true value... a picturesque spot on the beach for a low cost... please click here to read more about Carimar Beach Club. Carimar Beach Club is directly on one of Anguilla's best beaches, amidst some of the islands most romantic seaside restaurants, decorated with tasteful furnishings and for a very reasonable price! You can't go wrong. If you still haven't decided on Anguilla for your honeymoon destination, I think this recent trip report will seal the deal. This really tells you the essense of Anguilla. Anguilla is great for a Honeymoon! Congratulations on your upcoming wedding. Anguilla is our absolute favorite island. I proposed to my wife there in 2003 and returned for our honeymoon in 2004. We are returning for the first time since then on June 11th. Anguilla can be expensive and is known as a destination of the rich and famous, but it can be affordable too. Nori mentioned Carimar, which is where we will be staying. Some other reasonable hotels include Ku and Shoal Bay Villas which are located on one of the most beautiful beaches...but all the 30+ beaches in Anguilla are beautiful in their own way. Shoal Bay is considered the busiest but you would never call it busy. There are so many beaches where you and your husband will be the only ones there. Nori mentioned that "all inclusive" is not popular and that is a good thing. There are so many fabulous restaurants, both upscale and moderate, that it would be a sin to limit yourself to hotel buffets for a week. The island is easy to navigate and because there are so many restaurants to try, it makes sense to rent a car and explore. Relying on taxis would not be cost effective. The best thing about the Anguilla are the people. The Anguillans are honest, hardworking people that are will really impress upon you. I consider Anguilla the safest island that I have visited. You should still use common sense, but the sense of security you feel there cannot be found anywhere else. I hope you choose Anguilla for your honeymoon and like us I'm sure you will be charmed by it. We plan to return again and again. My fiance and I are planning on having our honeymoon in Anguilla mid-August (hopefully we don't run into a hurricane). We are looking to stay at the Viceroy Hotel because of their great deals during this season. I had a couple questions since you seem to be the Anguilla expert! 1) We will be flying to St Martin and taking a boat over to Anguilla, because the airfare is much cheaper this way. We will be landing in St Martin at 2:45pm. What is the best/affordable way to get to Anguilla from St.Martin? 2) What should we expect to spend each day on food (lunch and dinner)? 3) Do you think it is worth it to rent a car? We will be there for 8 days. 1) The most affordable way to get to Anguilla is by taking the Anguilla ferry system. The ferry departs from St. Martin every 45 minutes. You will have to take a taxi from Princess Juliana Airport (located on the Dutch side) to the port of Marigot on the island's French side. The ferry leaves from there. The taxi should cost $30. The boat coasts $20/person, and there is a $5 departure tax. This route is a bit more time consuming. There is also the option of hiring a private or semi-private boat. The semi-private boats run on a schedule, so call ahead to get their times and to book. The private charters you hire, so just call ahead to book and give them your flight details. The semi-private boats and private boats will meet you at the airport and bring you to the boat directly. If you want to get to Anguilla quickly and smoothly, I highly recommend Anguilla Air Services. This way, you do not have to leave the St. Maarten airport, or go through St. Maarten immigration. It is quick and easy, and the views from the plane over to Anguilla are stunning! Click here for more information on getting to Anguilla from St. Maarten. 2) Lunch can run you from $20-90, depending on where you are eating. For instance, burgers and rum punches at Uncle Ernie's on Shoal Bay, should cost about $20 (together). Lunch at Jacala Restaurant will run you closer to $50-70. Dinner can cost anywhere from $50-180, if you are ordering starters and wine. SandBar is a fun, affordable restaurant with tasty food that is very popular. Click here for a list of our favorite five-star Anguilla restaurants. 3) Yes! I absolutely recommend that you rent an Anguilla car. An Anguilla rental car will save you money in the long run, and allow you to really experience Anguilla. Taking taxis to various restaurants and beaches can get expensive, and it is limiting. Having the freedom of a car will allow you to explore every inch of this beautiful and very safe island! I would certainly recommend renting a car, and driving East from Viceroy to visit daVida, Cote Mer and Island Harbour and Shoal Bay! I am getting married in early September and would like to go for our Anguilla honeymoon in September. The problem is yes not a lot of places are open that time of year but is it really that bad? Is it still worth taking a chance on? We are from the Northwest (Seattle) and have done Hawaii a few times as well as Mexico and Belize. I have been looking at Anguilla for some time. We could take the chance that the Anguilla weather holds, but really how bad does it get? The Anguilla weather page says that temps are not bad and that only 3" of rain... Well that is still a lot better than home's temp and rain! The lack of crowds is perfect and the prices are right. But is it really worth taking a chance that time of year, for similar prices and travel time there is a lot of places to go on the Pacific and you wouldn't have to worry about hurricanes. From some of the research that I have seen though is that the island does not really get hit all that hard compared to to other places (north/inland). Nori's Reply: Jonathan, I have heard of people taking Anguilla honeymoons in the off season, even having Anguilla weddings well into hurricane season, but I haven't heard of any taking place as late as September. I do not recommend taking an Anguilla honeymoon in September. An Anguilla vacation is one thing, but, like you said, there is a lot more riding on a honeymoon. September and October is the height of hurricane season. It is true that Anguilla hasn't had as many hurricanes as other locations nearby (in the Gulf of Mexico for example), but the island has had its fair share, and gets them more regularly than some other islands in the Caribbean. Even if you don't get slammed, you can expect more rain, clouds and humidity than normal. This isn't "Anguilla weather at its best." #2) An island that is not only quiet, but down right "dead!" Starting in mid August most Anguilla resorts and restaurants close. Your selection of places to stay and places to eat are cut to a few spots. Many locals (expats and natives) take September and October to leave the island, visiting "back home" or just vacationing. As appealing as "quiet" islands are - most people I have met don't like it this quiet. Of course, it is possible to travel to Anguilla in the off season and have a wonderful vacation. In fact, Anguilla in summer is my favorite time. You don't have to share beaches, you don't have to make reservations for restaurants weeks in advance. It is quiet, peaceful, and of course, the prices are perfect! But I would not recommend visiting in September and October. May - August is the best time, with the best weather, even better than winter temperatures. The water is warm and the weather is consistently hot! Click here to another article on traveling to Anguilla in the off season. Click here to another page on Anguilla's off season. My husband-to-be and I would like to come to Anguilla for our honeymoon around September 20th. We want to stay at a mellow beach-cottage... don't need all the fancy amenities. Just a quiet, mellow place near a wonderful beach, good food and did I say quiet? We can't spend a fortune but I've always wanted to stay on Anguilla! Nori's Reply: Congratulations! Anguilla honeymoons seem so magical! The good news is quiet, quaint places to stay are not hard to come by in Anguilla. My best Anguilla accommodations recommendation is Carimar Beach Club, it is the best value Anguilla hotel you will find. Quiet, calm, with clean rooms with nice decor. The best part? It's right on one of Anguilla's best beaches, Meads Bay. For a low cost, Carimar Beach Club is the best value to be had on Anguilla! Have a wonderful time in Anguilla and a beautiful Anguilla honeymoon! Check out Paradise Cove for a true Anguillan honeymoon! Owned by native Anguillans, Paradise Cove with its beautiful gardens, pool, and lovely (and affordable) accommodations. Not directly ON the beach, it is just steps away from the gorgeous beach at Cove Bay - home to delicious Smokey's restaurant. The welcoming friends at Paradise Cove will take wonderful care of you - seeing to your every need and comfort. We have been their fortunate guests on many occasions and cannot wait to return! All the best to all honeymooners who have chosen Anguilla for their destination - they will NOT be disappointed, especially if they make Paradise Cove their home-away-from-home!